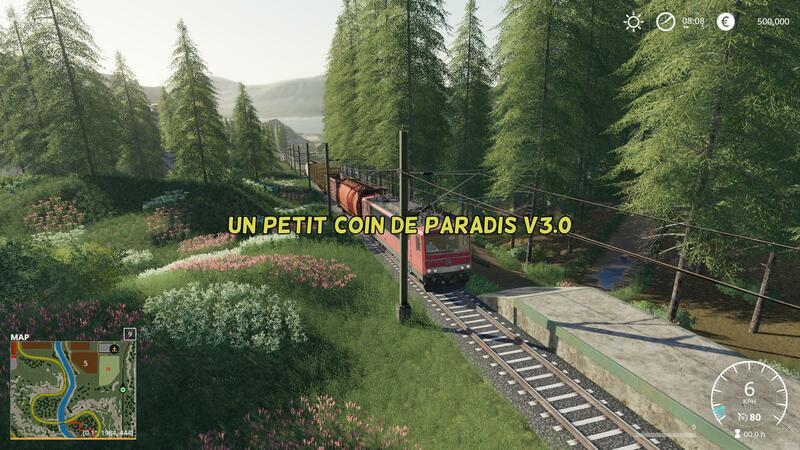 Mod Un petit coin de paradis v3.0 - Farming Simulator 19 mod, LS19 Mod download! Following a very big storm, all your farms have been destroyed there is nothing left even your house! Your insurance has offered you 2 things for your compensation! to rebuild your buildings or materials? After much thought you choose hardware, a big challenge! but knowing your courage and will and missions to perform you will hopefully “a little piece of paradise” finally yours ……………..
You start with a lot of equipment + 3 fields of which 1 grass and several fields available to you to rebuild to your taste, you have 1 large lot and another smaller to start and others will buy them. 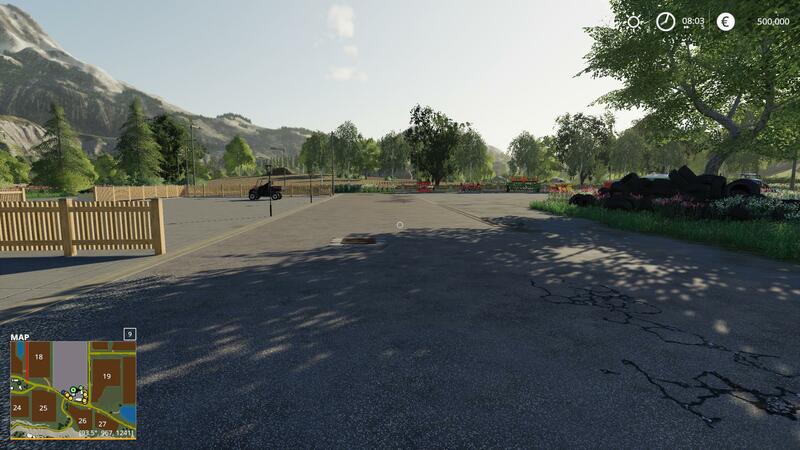 a single storage silo has been redone and included for storage of certain fruits which is essential for the maps, and a silo mutifruit in mods for the rest of the current crops and new cereals that you can place where you want! for the rest of you to play !!!! 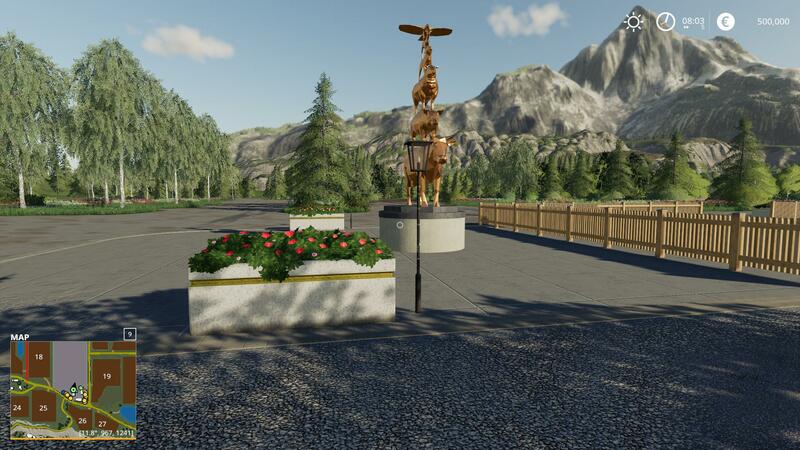 and with the mods on fs 19 “buildings, house, decor, trees and animals” you have something to do beautiful things ..
the maps is also made for you animals that feed on certain new cultures! I wish you good game !!!!!!! !!!!! New design of the maps ……. Following a very big storm, all your farms have been destroyed! 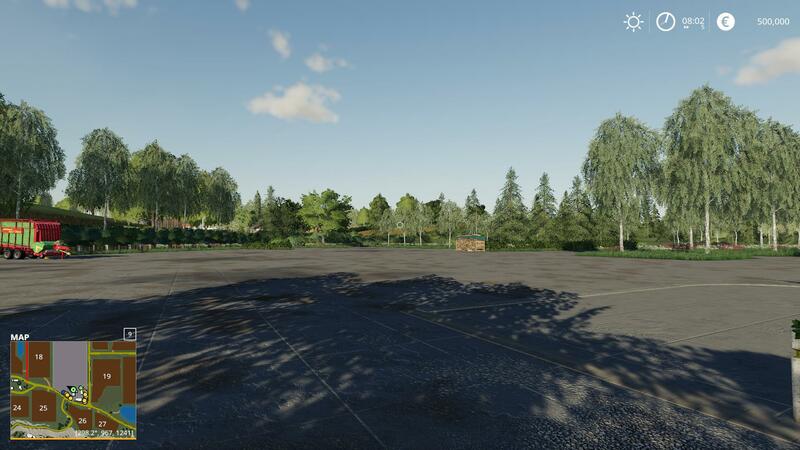 start … finally … 1 grass and several plots available to you to your taste, you have 1 large lot and several smaller ones to start and others will buy them. a single storage silo has been redone and included for storage of certain fruits which is essential for the maps, and a silo mutifruit in mods for the rest of the world crops and new cereals that you can place where you want! for the rest of you to play !!!! 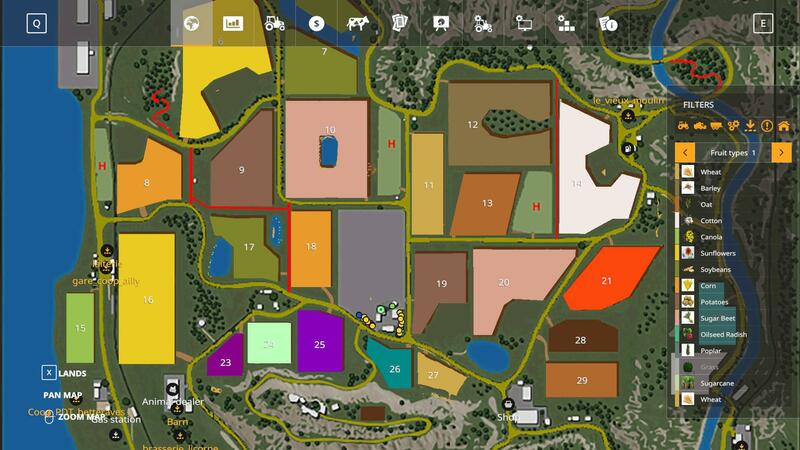 and with the mods on fs 19 “buildings, house, decor, trees and animals” you have something to do beautiful things ..
maps sont également made for you animals that feed on certain new cultures! I wish you a good game !!!!!!!! !!!! Neues Design der Karten ……. Nach einem sehr heftigen Sturm sind alle Ihre Farmen zerstört worden, selbst Ihr Haus hat nichts mehr! Ihre Versicherung hat Ihnen 2 Dinge als Entschädigung angeboten! um deine Gebäude oder Materialien wieder aufzubauen? Nach langem Überlegen entscheiden Sie sich für Hardware, eine große Herausforderung! Aber wenn Sie Ihren Mut, Ihren Willen und Ihre Missionen kennen, werden Sie hoffentlich “ein kleines Stück Paradies” breast, endlich ……………..
Sie beginnen mit einer Menge Ausrüstung + 3 Feldern, darunter 1 Gras und mehrere Grundstücke, die Sie nach Ihrem Geschmack umbauen können. Sie haben 1 großes Grundstück und ein weiteres kleineres Grundstück, um zu beginnen, und andere kaufen es. ein einziges lagersilo wurde erneuert und für die lagerung bestimmter früchte verwendet, was für die karten wesentlich ist, und ein silo-mutifruit in mods für den rest aktuellen kulturen sowie neues getreide, das Sie platzieren können, wo Sie möchten! für den Rest von euch zu spielen !!!! 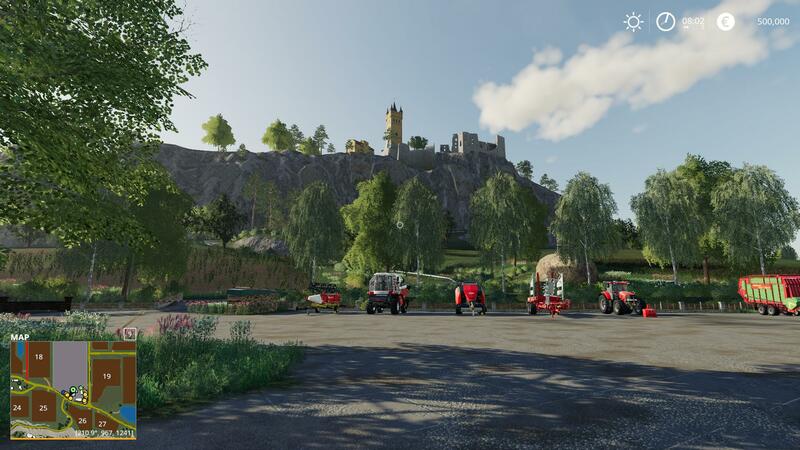 und mit den mods auf fs 19 “gebäuden, haus, dekor, bäumen und tieren” haben sie etwas zu tun, um schöne Dinge zu erledigen. Karten werden auch für Tiere erstellt, die sich von bestimmten neuen Kulturen ernähren! Ich wünsche dir ein gutes Spiel !!!!!! !!!!! !